When I was a kid my sister and I used to watch the TV show “Gidget” every day after school. It was sandwiched between something like “The Flintstones” and “Bewitched” on TBS or one of those cable channels that shows two-decade old reruns. Being Minnesota teens of the 80s I can only surmise that our adoration of the show was all due to the perky charm of Sally Field. We really loved the show and when my sister got Gidget – The Complete Series on DVD for Christmas, we dove in with gusto. It’s still as charming and entertaining as it was in the 80s (yes, I realize the show originally aired in the 60s). It was during some rampant googling to find every bit of Gidget trivia we could find that I discovered the tv series (and movies) were inspired by a novel. It took me roughly 18 seconds to order up a used copy of Gidget by Frederick Kohner, who was a screenwriter and father to the actual Gidget. The novel is a fictional account of Gidge’s summer the year she was fifteen and discovered the surfer dudes down at Malibu. If you’re familiar with the Sandra Dee movie from 1959, you’d be familiar with the story in the book. Young Francie happens upon some surfers and immediately falls in love with the sport. She attaches herself barnacle-like to this band of wayward surf bums with names like Moondoggie, Lord Gallo, Don Pepe, and Kahoona. 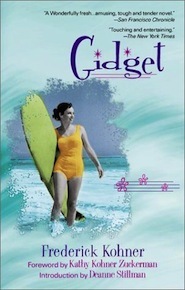 Gidget spends the summer lying to her parents, learning to surf, and endearing herself to the boys on the beach, especially Moondoggie a nineteen-year-old college man. There’s a lot of teenage dramatics and game-playing when it comes to the romance between Gidget and Moondoggie. Reading it is a bit tiresome, only because it’s become so cliche. But it’s the language here that saves the day. It’s reminiscent of Holden Caulfield with a lot of surf jargon thrown in. The dialog throughout is a lot of fun, if not wholly believable. At times it really did read like a sitcom and I wonder if that’s because it was written by a much older, widely-read screenwriter. Throughout the course of the book Gidget draws some pretty sophisticated literary allusions to her life. They don’t feel right coming from a lovestruck fifteen year old — no matter the era. Plus, I really couldn’t get it out of my head, especially during some of the more sexually frank passages, that this story was being written by Gidget’s dad. It felt kind of creepy. While I enjoyed reading the book, mostly because of the cloud of nostalgia around it, I can’t help but think it would have been more interesting had it been written by Kathy Kohner, the real-life Gidget, like she wanted. Guinevere, my niece and nephew (13 and 12) really dug the TV show when we watched it on DVD. It’s that awesome.